Singapore equities were dealt a heavy blow yesterday as markets reopened following a Christmas Eve sell-off on Wall Street. Growing turmoil in the White House has raised political risk ahead of the year end, Sumitomo Mitsui Asset Management senior strategist Masahiro Ichikawa told Reuters. The United States stock market is now on track for its worst December since the Great Depression as President Donald Trump continues to berate the Federal Reserve and investors remain unnerved by political developments, including a US federal government shutdown and Mr Trump's hostile stance towards Fed chairman Jerome Powell. On the local bourse, the benchmark Straits Times Index dipped 1.31 per cent, or 39.91 points, to 3,011.15 by the closing bell. Losers outnumbered gainers 263 to 109, after 490.8 million shares worth $517.3 million changed hands. The thin trading volume paled in comparison with Monday's churn of some 602.2 million shares worth $461.6 million. Tech stocks in particular took a beating, with Creative Technology plunging 16.2 per cent, or 76 cents, to $3.94, while Hi-P International lost 5 per cent, or 4.5 cents, to 85.5 cents. Venture Corp also lost 2.5 per cent, or 34 cents, to close at $13.54 apiece. The counter hit an intraday low of $13.48 and is now below its 52-week low of $13.81. Even on news that its subsidiary, Keppel Offshore & Marine, had secured new marine contracts with a combined value of $300 million, Keppel Corp edged down 2.6 per cent, or 15 cents, to $5.71. 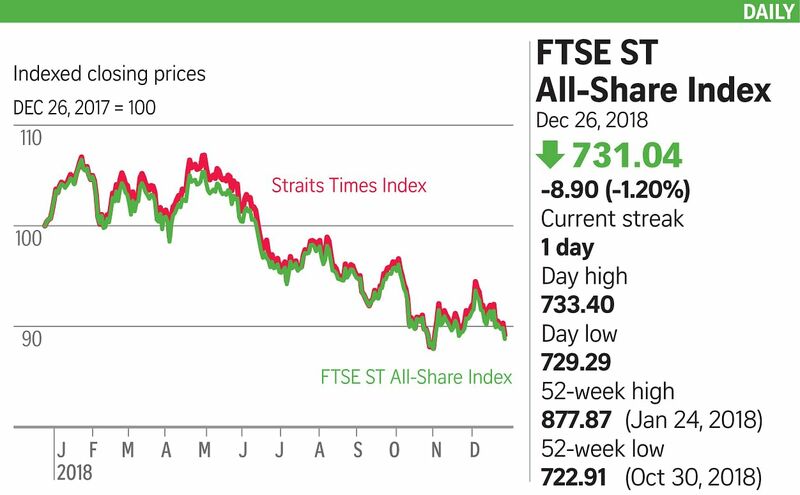 Other active stocks included Genting Singapore, which lost 2.5 per cent, or 2.5 cents, to 96 cents, with 17.8 million shares traded, as well as Singtel which fell 1.4 per cent, or four cents, to $2.90, with 11.3 million shares changing hands. Among the property stocks, UOL led the plunge, retreating 1.8 per cent, or 11 cents, to $5.93. City Developments, GuocoLand and CapitaLand all registered losses, though property developer Aspen bucked the trend to close up 12 per cent, or 1.8 cents, to 16.8 cents apiece. The property developer said on Monday it will seek shareholders' approval for a share buyback mandate to mitigate short-term market volatility, and other reasons. Even the financials were not spared from the rout. UOB slipped 1.6 per cent, or 38 cents, to $24.03; DBS fell 1.23 per cent, or 29 cents, to $23.28; and OCBC lost almost 1 per cent, or 11 cents, to $10.95. Mr Stephen Innes, head of Asia-Pacific trading at Oanda, warned that global capital markets are "in for a world of hurt" if the US economy turns south.